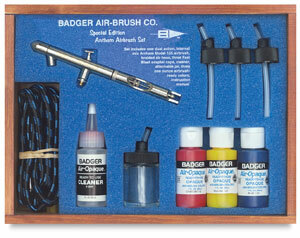 Badger opaques are for artists who demand vibrant color and consistent results. They're waterproof, and quick drying for use on paper, illustration board, Mylar, photos, photographic paper, and acetate. Each set includes three 1 oz plastic bottles of paint, three fast blast adapter caps, 6-ft braided air hose, one 3/4 oz jar with adapter, instructions, and 1 oz airbrush cleaner set in a keepsake wooden box with sliding see-thru cover.